The Consulate General of the Republic of Korea in Melbourne has announced that the ultimate cultural art concert ‘SHOW PASSION KOREA‘ will be held at Deakin Edge, Federation Square on April 9th for one night only. It starts at 6:30pm AEST and goes on for 75 minutes. The event has free entry on a first-come first-served basis. The main acts of the night are the world-famous performing arts groups Fusion MC and Dong Rak. Fusion MC, a leading B-boy crew from Korea, has won more than 30 World Bboy Championships since 2007 and represented its nation at ‘2019 Paris Battle Pro‘. Dong Rak is an upbeat performance team that specialises in Korean traditional percussion called samulnori. They have been one of the top traditional performing groups in the scene for years. Both teams will collaboratively put on a show for the audience that will surely impress them and lift their spirits. You can find more information about each group below. The program also shows the songs that they will be performing throughout the night. Don’t miss out on this opportunity to witness some of Korea’s best cultural arts perform live! 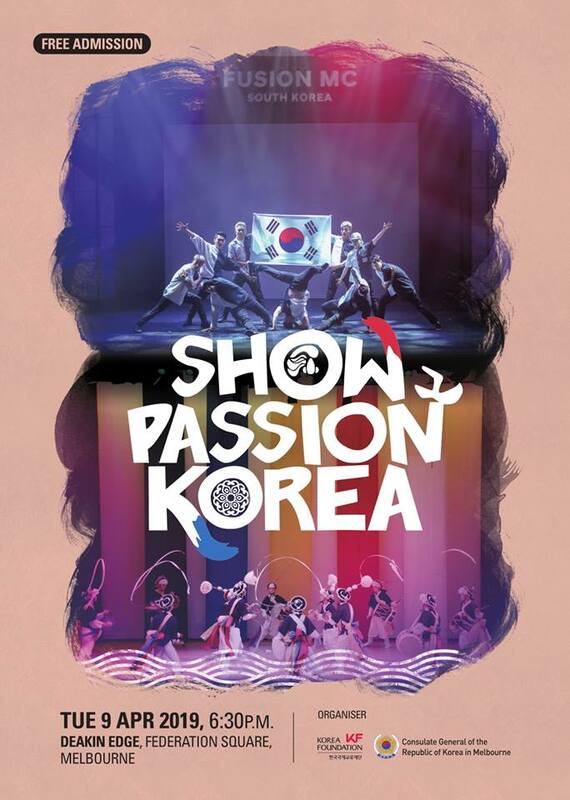 Will you be attending ‘SHOW PASSION KOREA‘? Let us know in the comments below.